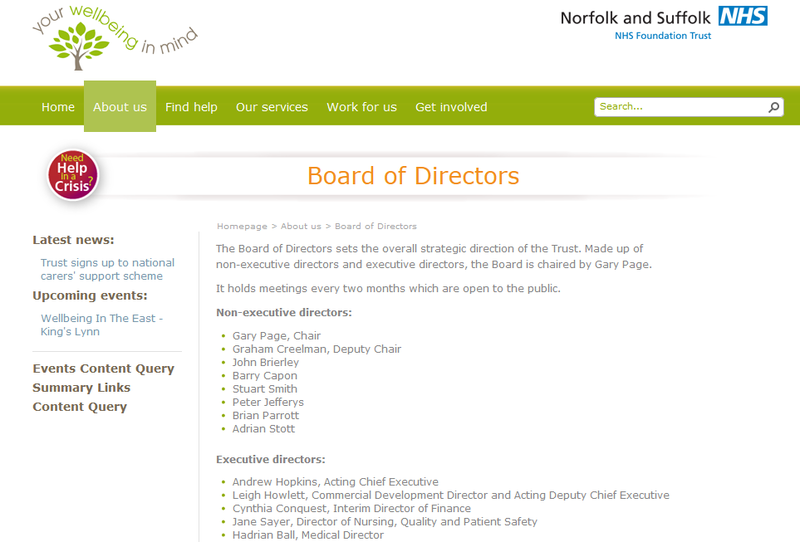 The £25,000 Norfolk & Suffolk NHS Foundation Trust (NSFT) website is four months late but better late than never. It still doesn’t work properly on a mobile or have social media integration but who uses mobile phones or social media on the Internet anyway? What great work by Cloud2 Limited’s sales department. Then again, at least the website gives some prominence to the ‘Your wellbeing in mind’ logo. That only cost £20,000 courtesy of Cobalt id. Congratulations to the Cobalt id sales department. Meanwhile, NSFT claims it hasn’t got the £46 for Norwich City Council annual parking permits needed by staff to visit service users in their homes; there aren’t beds for people in crisis and hundreds of cases are unallocated. Why do staff need to visit service users? Why do people in crisis needs beds? What do those community teams deliver? For the anoraks amongst you, it is interesting to see the non-functional orphan Events Content Query, Summary Links and Content Query links on the page below. It shows that despite spending £29,280 on Microsoft SharePoint training, £9,350 on design, £11,050 on development and another £4,600 on deployment (whatever that means), NSFT can’t develop a decent simple website using Microsoft SharePoint software for which the licenses cost £80,928. It is worth noting that there are errors even on the Board of Directors page, which is normally the only one directors read. Congratulations once again to the Cloud2 Limited sales department. For the non-anoraks, click on the image below to visit the new website. Sadly, in order to not waste space, the Operations Directors and the Director of Workforce and Organisational Development were cropped from the Executive Board when making this image. How embarrassing that the board has SO many people on it who have or have had, a career in finance, including as qualified accountants, yet the expenditure of the trust is a debacle……or I am missing the point.? ?